Today we awoke to definitive rain and a complete overturning of our planned itinerary and hike. We also are changing hotels today, so we had to load up the vans in the rain! Sant’Antine is the Sardinian dialect name for San Constantino, the Roman Emperor Constantine who converted to Christianity thereby giving the religion an official stamp of approval. Constantine is not an official saint of the Catholic Church, one of the aspects of this shrine that make it so interesting. 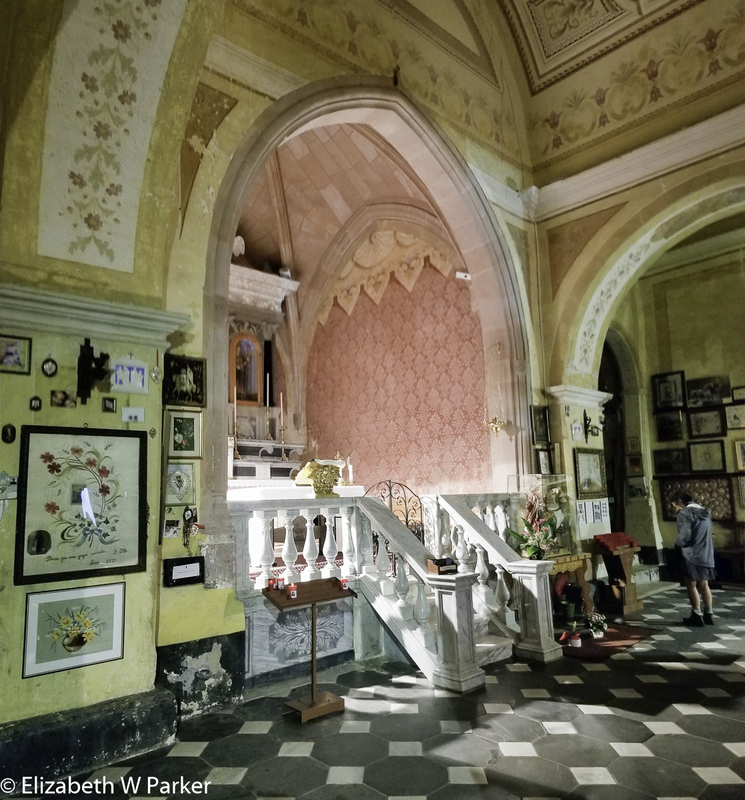 Sant’Antine Shrine interior – ex votos cover the walls! The interior of the church is fascinating. The walls, literally every inch of vertical space inside is covered with ex votos. If you’re like me, you have heard the expression ex voto and not a clear explanation of what it means. Ex voto is Latin for “in fulfillment of a vow” and in practice is an offering made, in this case to Saint Constantine, in gratitude for a prayer granted. Here, there are paintings, photos, poems and totems, but the vast majority are silver hearts, which in the muted lighting of the church, sparkle with tiny stars. It is really moving to walk among the columns and pews, reading the stories that accompany these offerings. Whether you believe in this sort of thing or not, the faith of those who do is inspiring. Looking from the Shrine back to the route of the horse race. The real drama of this shrine happens each year in July. Over two days the Sanctuary hosts a horse race called L’Ardia di Santu Antinu. The race begins along the road from the nearby town of Sédilo and ends in the Sanctuary. It dates back to medieval times, and to my mind, the relationship between the name and the word “arduous” is no coincidence. The horsemen ride full tilt on rocky, uneven paths into the sanctuary where they have to circle around various landmarks. Vying against each other for leadership in a race where there is no winner, finishing it on the back of your horse seems to be the goal. Sant’Antine shrine – this is where the riders and their teams congregate. My interpretation is that the ride itself is some kind of penance, or the vow behind the ex voto. As if it weren’t stirring enough to hear the hoof beats of 200 horses running at close range, there are other spectators firing guns into the air to add to the general bedlam. Read more about it and see the clips and pictures of the races at the link I gave you above. There are also YouTube videos. At the site itself, there are also pictures. That long, low, roofed and windowless building I mentioned earlier? That is the place where the horsemen congregate and organize themselves during the festival. The horses, at least in modern times, are stabled in their own area, away from the confusion and with a veterinarian on site! 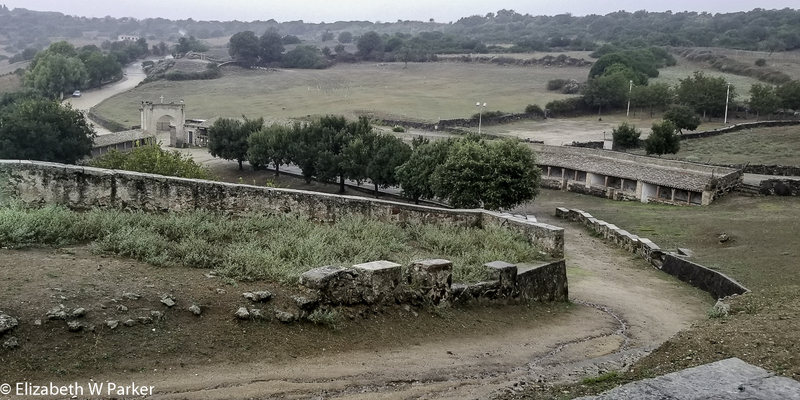 With all of the rain it was impossible to hike to a Nuragic site on our itinerary, but our guides, ever intrepid and innovative, arranged several other stops for us that we enjoyed immensely. The first was a visit to the Mediterranean Mask Museum in Mamoiada, a town near Nuoro. It is hard to know how to start to explain to you what this town is famous for and how it unfolds … here’s a stab at it. As part of the Carnival celebration (Carnival as in carnevale, the lead up to Easter), there is an annual parade of frightening characters called mamuthones – men dressed in shaggy sheepskins, wear black wooden masks and weighed down with cowbells of all sizes. The festival is very old and may originate in a pageant to address the bad spirits and fears of the rural population before a new growing season begins. The other major character of this festival is the issohadores – men dressed like gendarmes who control the mamuthones on leashes. If you are familiar with the Vejigantes of Puerto Rico’s Carnival, you will note the similarities. The museum has a multi-media presentation that is very good, and might be about 15 minutes long. After watching that, you enter into the museum displays, where you find manequins dressed as mamuthones and issohadores. It is interesting to see up close and to walk around the figures, particularly after seeing how frightening they are in the film. But the museum isn’t satisfied with just the local characters. Here you can also see masks and costumes of similar characters from other regions in Europe. The Spanish figure could easily have come from Puerto Rico – Not the Ponce tradition, but the one in Hatillo! Before I talk about our winery lunch, I want to skip to the afternoon. We actually visited the workshop of an artisan well-known and respected for making the mamuthones’ masks. His workshop was filled with cowbells of all sizes, costumes and masks of amazing expressiveness. Walking along the street of Mamoiada, there are many murals and references to the Mamuthones. Our guides arranged for us to have lunch at the Giuseppe Sediesu Winery in Mamoiada. It was a feast, especially appreciated for having been arranged at the last minute. The highlight, of course, were the wines, both red and white, and fortified. The tastings and pairings were wonderful. Probably the most unforgettable part of the winery lunch, and the tour we had afterwards, was a tiny little dog, who seemed to break all of our hearts. He loved to be held; he would nestle on our feet under the table; he followed his mistress around as she gave us our tour (but whenever possible slept in the arms of someone willing to hold him). Absolutely adorable! After our trip to the mask maker, loaded in the vans, we had another hour’s drive to the family-run Su Gologone Hotel (resort). Located near the town of Oliena, it would be our base for our last day and the for our departure at the end of the tour. The place is magical. Everywhere you look there is something interesting that catches your eye. Like the Negresco, where we started this trip, Su Gologone is filled with art. Here the art takes the form of Sardinian crafts, modern and traditional. The similarity continues – both are run by the widows and children of the original owners. That first night we had dinner in the hotel’s dining room (even the guests have to make reservations as it is ardently sought after). Famed for its Sardinian specialties, our dining room has an open hearth fire for roasting meat and grilling steaks. The smell is divine! So was the food. And, believe me, no one gets up from the table with one centiliter to spare! Another rainy day threatens, so we added an hour’s stop in Dorgali for shopping. One thing we have not had on this trip is time to wander city streets and shop – either we are not in a city or our free time is too late in the afternoon and we are too tired to do the additional amount of walking that shopping requires. Thankfully, we have this hour. I have distilled exactly what I want, so I found a good shop, and got everything I wanted there. One of these was a cork tray. Not a tray made from cork, but a piece of cork bark usable as a tray…we saw them at our lunch with shepherdess several days ago, and despite our misgivings about how to keep them clean, many of the trippers purchased one to take home. I also found a few gifts made from olive wood, not necessarily unique to Sardinia, but something I know will please, and a couple of pieces of the Sardinian embroidery we have seen in this area – almost like a hooked rug. A yellow piece for the blue room at the farm, and a white on white piece that I will probably take to San Juan. Today’s hike is in terrain that reminds me of Mallorca – very stony. The white rocks are dotted by the green of juniper bushes, all very rugged and remote feeling. Unfortunately, as I reached into the back of the van to capture an errant hiking pole, something popped in my knee. Severely hobbled by the pain, I could not hike with the group – a fairly easy walk up a single track cement road to the holding of a goatherd. 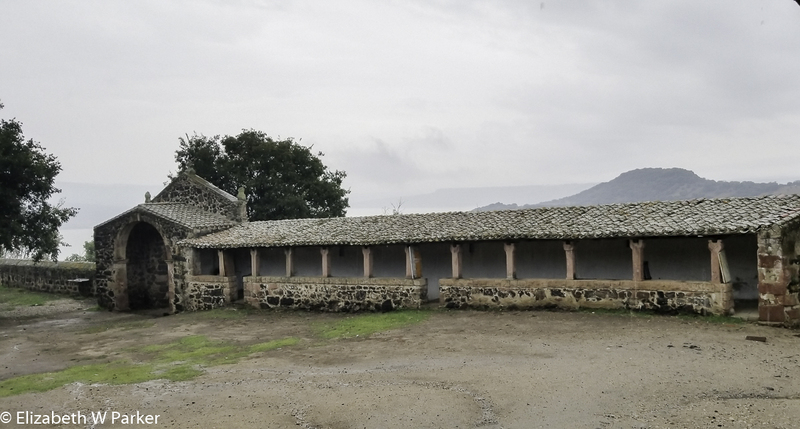 Instead of walking, I went in the van, arrived early and was able to listen to the goatherd and Stefano conversing and to learn a bit about the place before the others arrived. Our goatherd is Lino, and he actually lives down in Dorgali, with his wife and children. He has been a goatherd from his childhood, basically following in the footsteps of his grandfather. He does not own the land here where he keeps his goats, but having built a conical hut of stone and juniper he has the right to this plot and the grazing of his goats for 99 years. Annually he pays a fee to the state for each goat he grazes. He has between 180-200 goats. His goats are quite handsome: They are Sarda goats, a little smaller than average, with tiny ears and long fur. They are raised for meat, milk and their pelts (but not for wool). 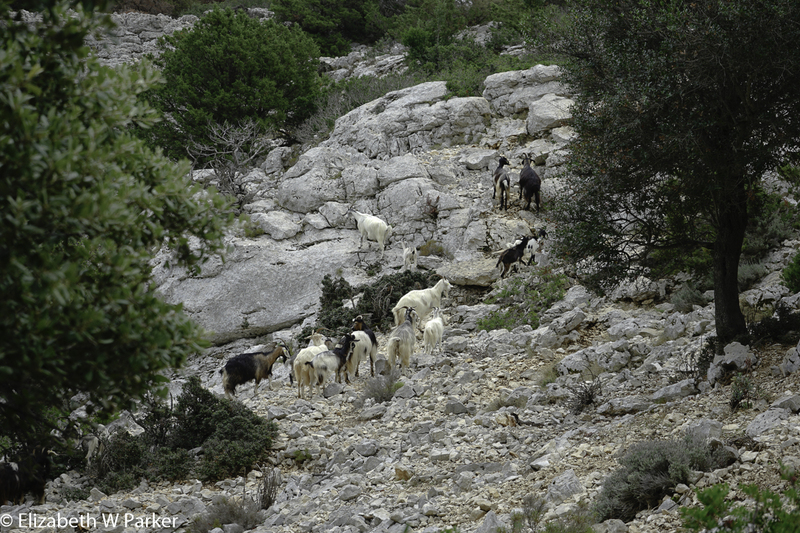 The breed is ancient; one of 8 autoctonous goats breeds of Italy. There are lineage books maintained for these animals! Pretty much celebrities! Lino makes goat’s milk cheese and our lunch today is cheese, sliced meat, incredibly fresh and ripe tomatoes – simple fare served outdoors – a really wonderful lunch. Of course, there is also wine and water, an onion confit that complimented the sharp cheese, and a cheese spread with a tangy taste that everyone seemed to enjoy. I have forgotten what we had for dessert, but mirto was offered along with coffee after the meal. The goats are basically wild up here. They roam where they will, though they know where home is and will head there when the weather threatens. They were all around our little plot of land while we had lunch, apparently to shy to come in when there was no immediate need (the rain started after we had finished). By building a typical structure, I apologize that I have not recorded it’s name, the goatherd establishes a right to graze his goats on public land, and to improve his plot. He gets a lease for 99 years. He does pay a fee for grazing – a fee based on how many animals he has. Several aspects of this visit are worth mentioning. Lino, up here all day with time on his hands while the goats are off grazing, has built not only built the required conical shelter, but had built a second smaller one and a bathroom for guests. Using intricately curved and worn juniper, he had also fashioned gates and a covered terrace for his lunches. His seemed adept at using the ubiquitous stones, too. The effect was very pleasing to the eye, all grey and white, against a landscape that was white and green. He mentioned that his grandfather’s plot does not have access via a road, like his does. The road means he can entertain tourist groups, fortunately for us. My little van party drove down the mountain – the road was an adventure! Remember I mentioned it was a single track? We didn’t have to negotiate around any cars coming up the road; That might have been extremely tricky. But the ride was heart-stopping in places nonetheless. 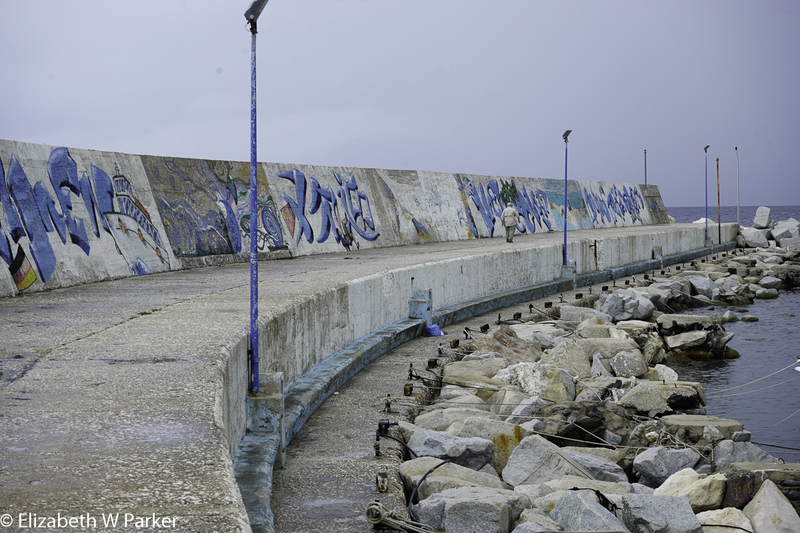 We went all the way down to Cala Gonone, a seaside community famous for its access to the pocket beaches of this coast. It is just slightly south of the Costa Smeralda for which Sardinia is known to the world’s jet set. Here we basically got to wait. The hikers were headed to Codula de Luna, another of the beaches. 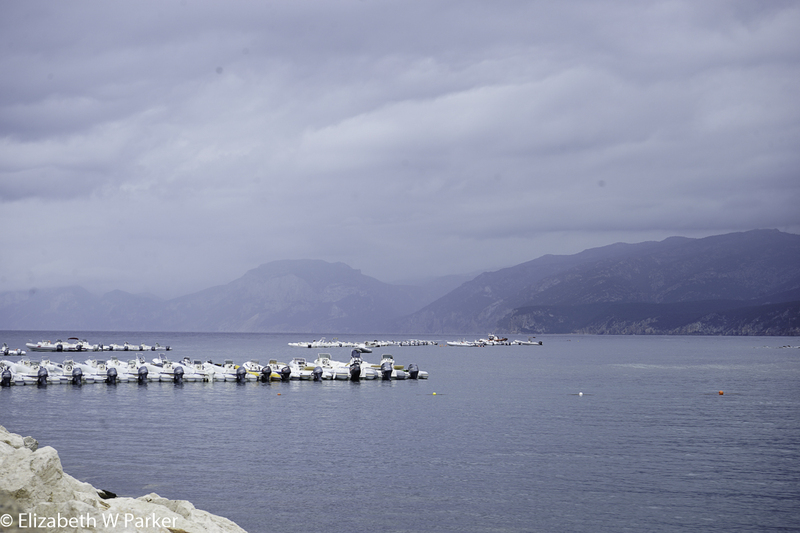 From there they would take a boat back to Cala Golonone. The dark skies did nothing to reveal any beauty around the port where we waited, but we managed to make the time pass walking on the breakwaters, photographing the boats and sitting in the cafés that fronted the whole scene. As I mentioned, the hikers were drenched when they rejoined us…boots and all. But they had fun, evidenced by their laughter and good cheer upon reaching the vans. That evening we had our final dinner together. As you might expect, we toasted to our guides and our companions, to the good time we had had together, to future trips with equally good groups, raising glasses of sparkling rose. 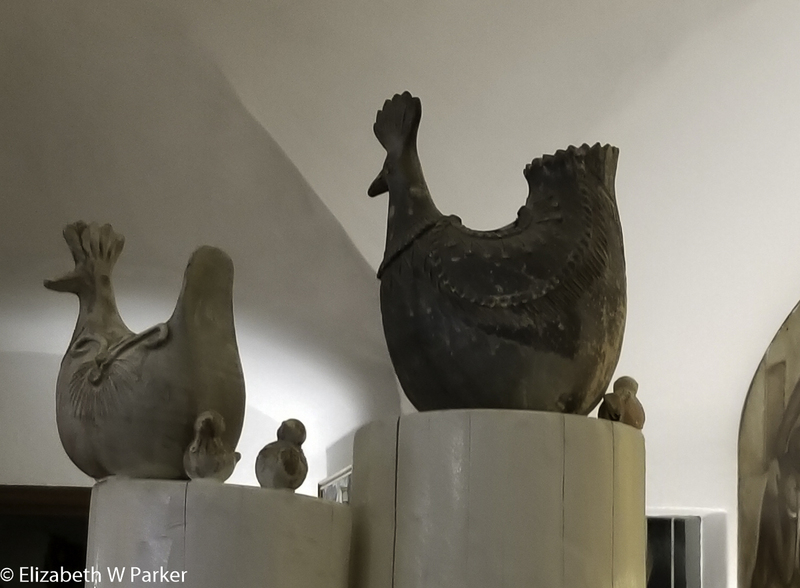 Our final dinner was another feast in Su Golonone’s dining room with stewed lamb and caprito (baby goat – hard after seeing the little fellows with their mothers at lunch). Heartfelt goodbyes and wishes for future contact, and the tour was wrapped up. Gerry and I rose the following morning at 4:00 am to take a taxi to the airport in Olbia for a 7:00 am flight to Rome. We had enough of a layover to pick up our suitcases (we were advised not to check them through), re-check them with American, pass through security again and visit the premium class lounge for breakfast and rest break (all this despite my slow, hobbled walk). The flight to Chicago was comfortable and relaxing. My favorite part was playing with the window “shades,” actually self-dimming and brightening glass. Super cool (I am easily amused)! And that is it! One our way home I stopped to reflect about this trip in general. General thoughts about the trip. Both Gerry and I loved this vacation! LOVED it! Please note the intentional capital letters. The scenery in both Corisca and Sardinia is extraordinary. The food was great, everywhere. Everything was fresh and local. Though we had more cured meat and cheese than I have eaten in the last 10 years in just two weeks, it was worth it to taste the local specialties. Fish and vegetables were also front and center in most of our meals and there was no reason for anyone to go hungry. We were very pleased with the experience with Wilderness Travel. Some of the hiking was above our level, but the scenery we saw was worth every step we took. (It was also nice to push myself.) 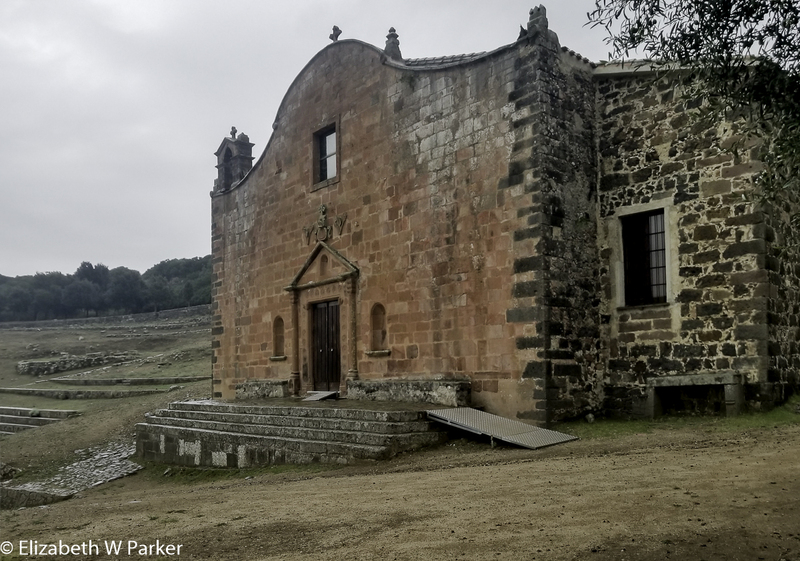 We had wonderful weather for most of the trip, and the rain of the final two days gave us the opportunity to see more sites, not just scenery, and the sites we saw only whetted our appetites to learn more about Sardinia and to return. The varied hotels and meals that Wilderness arranged for us were memorable and covered a wide range of foods and experiences. We will travel with them again. And, if we do another level 3 or higher hiking trip, we will definitely be in shape BEFORE we go! For me, people are the key to a really great vacation. Meeting new people and interacting with locals are the most memorable experiences I bring back. On this trip, in both Corsica and Sardinia, the local people were friendly and fun, and encouraged us in the use of our rusty French and Italian, as well as helping us to appreciate their culture. Our Wilderness Travel guides were excellent, very experienced both in the hiking parts of our trips and in the hospitality and logistical aspects. They were free with their friendship and knowledge, too. And our fellow hikers on the trip were diverse, interesting, accepting and flexible. Ready for fun, we had lots of laughter to share. Corsica and Sardinia are very similar – though I am sure the inhabitants of those islands would disagree. They share a continuous geology, some of which is underwater. They both have an uneasy or maybe uncomfortable, relationship with their overseeing country. The people feel they are not really French or Italian, but independent Corsicans and Sardinians. It is something I see and feel in Puerto Rico, too, though in all three places, it is a feeling that is fading. I do not think indepence for these three places is a viable political future in an ever global world. Small and independent is hard when the world is dominated by big players. 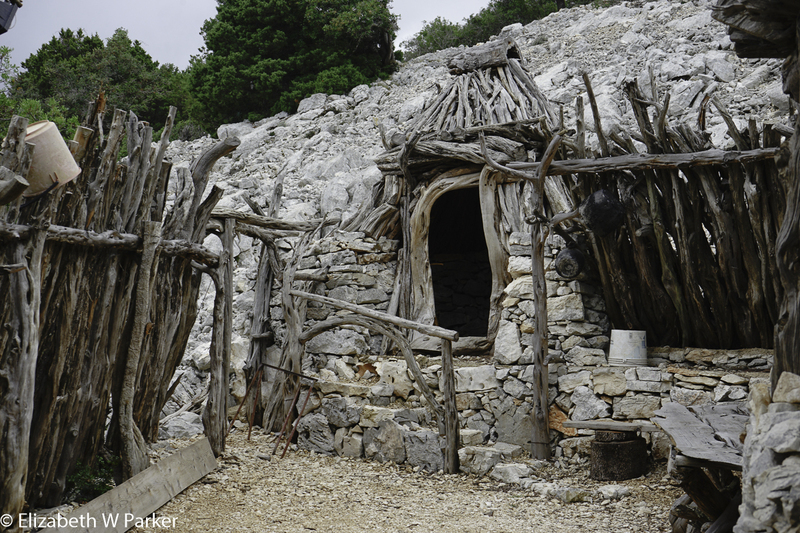 The languages of Corsica and Sardinia are similar – both in their sounds and their roots. Though we didn’t see much French in Sardinia, we saw a lot of Italian in Corsica. But, if language is a window into culture, the similarities between Corsican and Sardo could explain many cultural similarities. I was reading about a race in Carrington’s Granite Island (about Corsica) that described the race I mentioned just above l’Ardia. Of course, there were other similarities too, but my reason for mentioning this is that, even after the trip, I have to sit down and think about what we did in Corsica and what we did in Sardinia and attempt to separate them. It isn’t easy. I think I could go back to Sardinia and hang out for a couple of months. I felt very at home there, and I was able to speak to people in Italian, and it was coming back very quickly. I am still finishing Granite Island, but I could also see myself returning to Corsica and following in Carrington’s footsteps to see everything that she saw, half a century later. These are islands that have so much to discover, particularly if you love history. A microcosm of European history, these islands have it all! From pre-history to the modern world, events were played upon this stage, a stage that is pretty much forgotten and ignored. But fascinating nonetheless! I hope you have enjoyed reading this. If you decide to visit Corsica and/or Sardinia, please stop back to let me know what you thought. And, if you have already been, please share your thoughts with me here.